I am a Digital Artist and Maker. When I was 10 I wanted to be a Geologist/Artist/Architect. I work as a Designer/Developer in web and digital media. 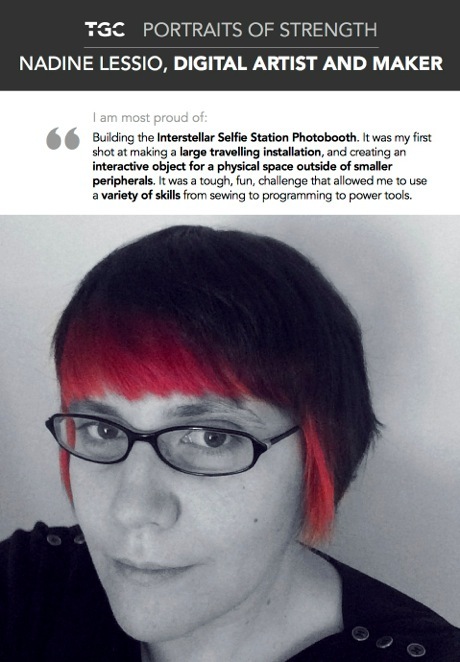 I am proud of building the Interstellar Selfie Station Photobooth. It was my first shot at making a large travelling installation, and creating an interactive object for a physical space outside of smaller peripherals. It was a tough, fun, challenge that allowed me to use a variety of skills from sewing to programming to power tools. The biggest obstacle I have faced was self-doubt and learning to just roll with who I am. There are a lot of people who will try and peg you into certain roles, especially if you are cross-discipline. Learning to be vocal about that has been an ongoing process. My advice to women is don’t be afraid to try things you are unsure of. Everyone at some point did not know what they know today, the best way to figure it out is to dig in. Experiment with your ideas and see where they take you. Find people from different industries to work with, and get to know yourself well. Your direction in life will flux, knowing yourself gives you a solid home base.